Aftermarket services are available for all of our product lines including our oilseed processing equipment, polymer dewatering and drying presses, fiber presses, hydraulic presses and rubber mixers. Regardless of the age of your French or TMP machine, we have the engineering records to complete your needs with solutions that work the first time, every time. Contact French Aftermarket Sales for more information regarding our parts and services or request a quote. 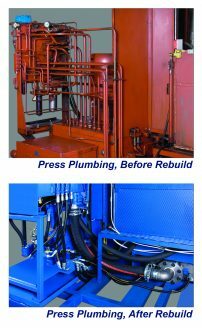 After years of rugged use, the Timken Company’s 68-year-old, French 500-ton hydraulic straightening press press required its first major replacement part, a new top plunger. Read how using the original bill of material and archived drawings, French’s Aftermarket Sales Group, engineering team and machinists were able to make and improve the design of the replacement part. 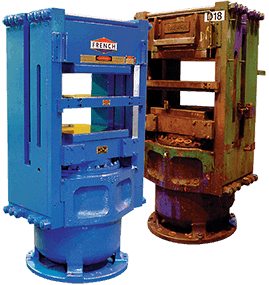 French’s hydraulic press rebuilding services improve customers’ profit through increased production and energy savings, reduced safety hazards, enhanced press reliability and part quality with lower scrap rates. French rebuilt ten 400-ton hydraulic presses with electric, hydraulic and mechanical improvements to give the customer controlled heating and pressing in their molding process. After six months of operating the rebuilt presses, the customer reported over 20% energy savings.